Is Your Dog Really Stubborn? Let me say right off that this is something that gets me a tad hot under the collar. The thought of the countless dogs out there dealing with the consequences of being labeled as “stubborn” and “defiant” when in reality they are just confused, BURNS MY BUTTER. One last thing before I get started. This topic is large enough, and deep enough, to fill a book. That means, this will NOT be the last article you see on it by any means. Perhaps we should make sure we don’t have different definitions of the word stubborn. That sounds like a good idea, afterall, this topic is really all about communication isn’t it? Another common word that is used in the same context that gets me equally irritated is “defiant’. Often times on the internet I see people seeking help for their “defiant’ pup. Let’s look at that definition as well. Now that we have gotten the definitions out of the way, we can be assured that we are talking about the same things. This is your last chance to abandon ship on your claim that your dog is stubborn or defiant and use the excuse of ignorance on the terminology. Why Do You Think Your Dog is “Stubborn” Or “Defiant”? You are convinced your dog is simply ignoring you or has a “listening” problem. After telling the dog to “come” several times there is still no dog at your side. The dog is happily sniffing away at the same patch of grass it was thirty seconds ago without a care in the world. Now you are on the internet ranting about your thickheaded, stubborn, defiant dog who refuses to listen to you. I hear so often this exact same situation. If it isn’t that the dog won’t come to them, its the dog wont sit, or the dog won’t lay down. You name it, people are out there convinced their dog is being difficult and knowingly disobeying them. Even more mind-numbing is when the complaint is that the puppy “knows what to do” and is “refusing” to do it. Recently I had someone “complaining” that when they say the puppy’s name the puppy just sits and stares at them. Why is that mind-numbing? Well, to have a puppy who stares at you is to have a puppy that is actively engaged with YOU, not the environment. That is EXACTLY what a puppy or dog should do when they hear their name, STARE AT YOU!! That is actually one of the first important behaviors that every puppy or adult dog should learn to do with their human. As you can see, there are some people and dogs out there who could use some help with their relationship. How Do You Know That The Dog Knows? The fact that people are “convinced” the dog is being defiant depends on another presumption. That would be that there is in fact something to defy. If the dog does not know what you want, then by definition of the words themselves, it is incapable of the act of defiance. So how do you know your dog knows? When people say that their dog knows a command, I have to bite my tongue and take a deep breath. 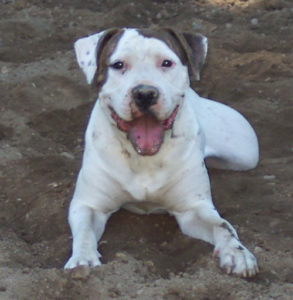 I started helping people (friends and family) with their dogs and training in 1996. I started doing it for compensation in 2003. I can honestly say, the vast majority of people who think their dogs “know” what to do, or are “fluent” on a command are wrong. Just because every time you tilt your head and bend over and extend your hand while you say “sit”, and the dog then sits, does NOT mean the dog knows what the word “sit” means. Instead say “banana” or “sally”. What does the dog do? More than likely the dog will sit, just as it did the first 20 times you did it previously because the dog is watching your body language not listening to to your words. Or if you are so sure the dog knows the word “sit”, then turn your back to the dog and say it. What happens then? Have you even tried? What about location? Have you taken the dog to a variety of locations? It’s especially difficult for me to be nice when somebody tells me that their puppy “learned sit, down, stay, and come” in a week. That isn’t even enough time to proof and teach the dog to generalize the behavior. You don’t know what generalize means? Exactly my point. So What The Hell Does Generalization Mean? I could break it down and explain it to you, but honestly, right now, you’re not ready. I want you instead to do some re-thinking, or perhaps, thinking for the first time, about how much your “stubborn” and “defiant” dog really knows. There are layers upon layers of work in the form of patient and clear teaching that goes into helping a dog become fluent on some random sound that comes out of our mouths and associate it with a behavior and then do it anywhere, no matter what. If you haven’t done that, if you can’t explain to me, or anybody else your method of clear and concise instruction followed by how you tested to make damn sure the dog knew it, then please….PLEASE…. Do NOT call your puppy stubborn. 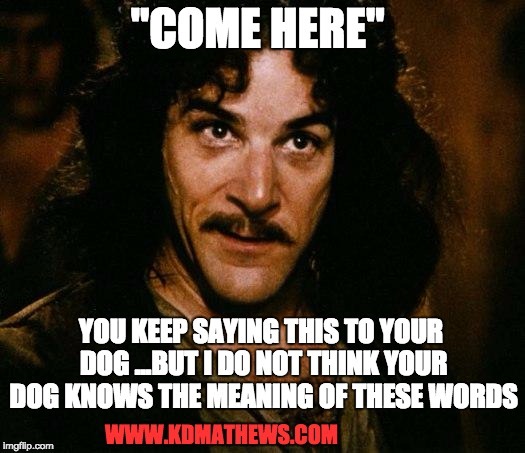 At this point you have to go back to the basics of dog communication which are described in detail in my free ebook that you can get from the pop up window that you closed about 5 seconds ago (click HERE to get you’re copy). In Operation Dog I explain the fundamentals of how your dog communicates with other dogs as well as you. For the dog, spoken words are not the first thing they look to when wanting to communicate with you. They have no idea what any of those funny sounds mean. Instead, dogs rely on our body language to predict our behavior as well as our wants and thoughts. This is why trainers who glorify the use of hand signals are either morons or frauds. It’s MUCH easier to train a dog to respond to a hand signal than it is to a verbal command. I see a disturbing number of trainers who brag about hand signal training as if its some type of accomplishment. Then they charge “extra” for a client’s dog to respond to hand signals! Like i said, moron or fraud, either way, garbage. In the beginning stages of teaching a dog any behavior, chances are good, they are watching and responding to some subtly of your body language. That tilt of the head, bend at the him, lift of your hand, all communicate to the dog. Most people don’t even realize they are doing it, but they are. You also need to have more than one behavior that you think your dog knows in order to get a better idea of how well they know each. If “sit” is the only thing you have said to your dog, then simply saying sit, and watching them sit means nothing. They could be responding to your body language like we just discussed. Or if you have been diligent about your awareness of physical cues, they absolutely could be simply responding to the sound of your voice alone. That is where you need to start saying other words and seeing what they do. When you have begun to work on “sit” AND “down”, that is when the real proofing begins. If you can tell your dog to “down”, then without saying or doing anything, tell them to “sit” and they do, you know you are on the right track. This however is where many will get stuck because they simply do not understand how the dog perceives these behaviors. To the dog, going into a sit, from a standing position is TOTALLY DIFFERENT than rising into a sit from a down position. Well, hopefully you are at least in a contemplative state of mind. Think about ways you can determine if you dog actually has a clue what you are talking about and perhaps you should put those labels of stubborn and defiant on the shelf for a little bit. When a student fails a test on material they were not properly taught, the fault lies with the teacher. You are your dog’s teacher. **think your pup knows sit and down? Take the selfie challenge! Take a look at this video and make your own, post it on instagram or facebook and tag me! CLICK HERE TO SEE THE VIDEO AND TAKE THE CHALLENGE! !